Hi, I'm Michael Woo, UX Manager at Up Top and I'm here to talk to you about why Journey Maps are important to your business. So what brought me to doing this exercise is the fact that every so often we are dealing with situations on projects where we need to improve how we do things, both internally and externally. For example, how might we improve the kickoff process for new customers to make them more streamlines and impactful? Doing a Journey Map, it allows us to tackle several things. Number one, it lets us holistically look at our customer touch points end to end. It allows us to form actionable insights by looking at pain points and opportunities. It also gives us visibility and exposure by the simple fact that we have these large 8 x 10 foam boards in the office so that it's visible than more than just a few. And it's a great exercise in collaboration where it allows many folks from different groups to get together and contribute. So initially I started off by laying the groundwork for the Journey Map myself knowing the fact that when I was going to bring in additional people things could change. So at a later point I brought in marketing, sales, project management and developers to help fill out their areas of expertise and later in brought in the UX design team to help flesh it out some more. The value that this Journey Map has brought is it's created a lot of actionable insights that they've incorporated into various road maps within different groups in the company. It's also created a lot of visibility, as I said before, around the office to create alignment internally and in fact we have a scheduled company wide workshop in a couple of weeks in which it will be used as a baseline artifact to get the rest of the employees up to speed about how our company actually works. Again, this Journey Map will be a living and breathing thing in which we'll continually learn about ourselves and our customers. Creating the Journey Map was relatively simple and I was surprised by the amount of support that I received from all the folks that contributed to it. Again, if it's your first time doing it, it can be very daunting but there are plenty of resources out there to help you along the way. Good luck on your next Journey Mapping exercise and we hope you have as much fun as we did at Up Top. Tune in next week for another episode of Turning on the Desk Lamp. 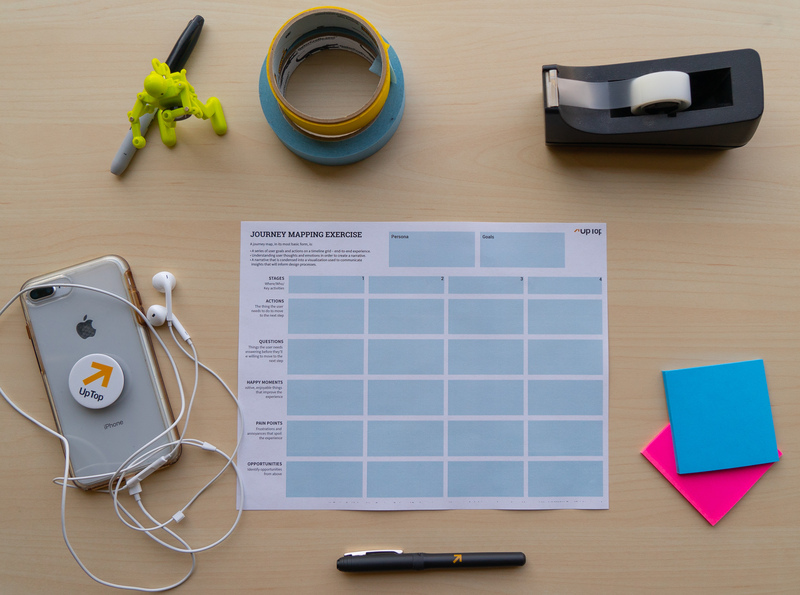 Are you ready to start your own journey mapping exercise? We've put together a worksheet for you to just that!